Taking "leave" of the planet, ISS style. This week, NASA astronauts Scott Kelly and Kjell Lindgren took some time to enjoy a Thanksgiving dinner, space style. The preparation is efficient, at least. 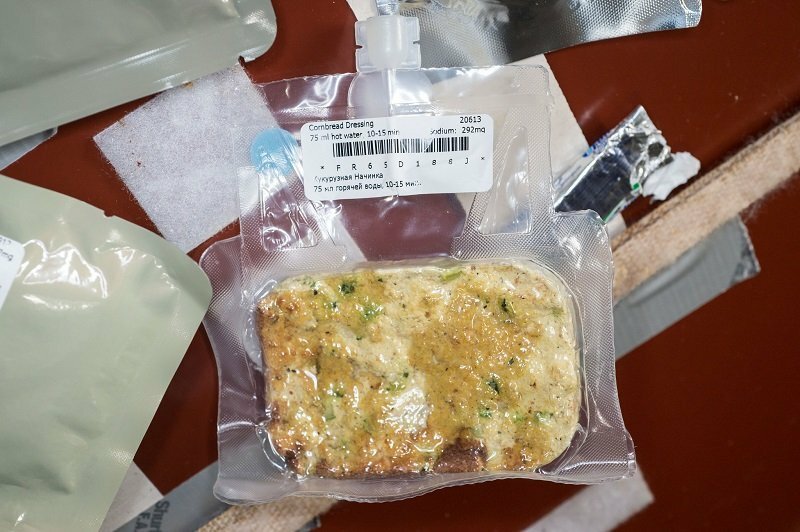 NASA also explained the recipe for their Space Food Systems Laboratory's own cornbread dressing. Hopefully someday soon, we'll get to use it to celebrate as pilgrims on Mars. Astronaut Lindgren captured another kind of pioneering pilgrimage in this image of farms in a desert. We are our own crop circles, sometimes. Astronaut Kelly sent home well-wishes to his friends and family in New York and New Jersey, whom he swooped over just a little too far away to have the potatoes passed to him. But what does the Macy's Thanksgiving Parade look like from space? Kelly also posted an abstract "Earth Art" shot of a range of foreboding mountains, with the caption, "#EarthArt Sometimes rugged terrain is really just a worthy journey. #YearInSpace." are preparing to return to Earth for a December 11th landing. Meanwhile in Russia, Expedition 46 Soyuz Commander Yuri Malenchenko and Flight Engineers Timothy Kopra and Timothy Peake are prepared to launch for the ISS on December 15th. That's all for this week, space fans! Check us out next week for more on the Cygnus ship's Thursday arrival at the ISS. Watch this space! Even if you don't celebrate Thanksgiving, you can take a moment to appreciate this.